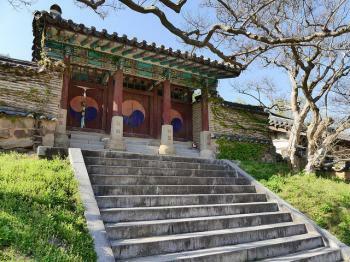 Seowon, Confucian Academies of Korea is part of the Tentative list of Republic of Korea in order to qualify for inclusion in the World Heritage List. I visited 3 seowons in Andong in April 2017, namely Hwacheon Seowon, Dosan Seowon (already reviewed) and Byeongsan Seowon. The latter is strangely included in the core zone of the Hahoe WHS even though it is strictly speaking outside of the village. Of the three seowons I visited, my favourite one was Byeongsan Seowon which is a formal Confucian academy founded in 1575. It was built with educational facilities for scholars and also for the younger generation and it also has a shrine for memorial services. 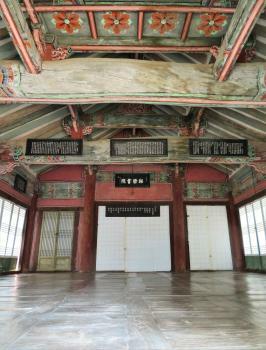 In 1863, King Cheolgong bestowed a hanging board inscribed by the king's own hand with 4 hanggul characters that gave this seowon its name and making it one of the royally chartered private academies. In 1871, Daewongun, father of King Gojong, closed all but 47 private acadamies across the country. Byeongsan seowon was one of the 47. Bongnyemun Gate, the main entrance, leads to the Mandaeru Pavilion and Ipgyodang, a lecture hall with dormitories called dongjae to the right and seojae to the left. Behind the dongjae stands Gojiksa, a residence for the academy caretaker. 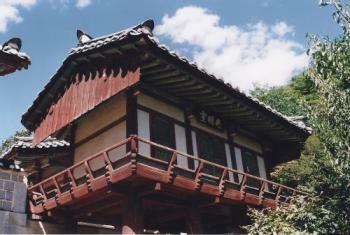 Behind Ipgyodang is Jangpangak, a storage space for wooden printing blocks and relics. 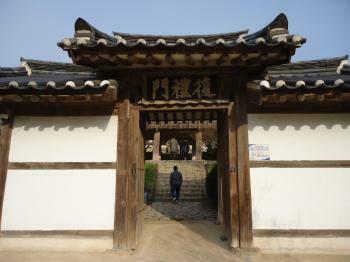 Stairs lead to Naesammun (photo), the gate to Jongdeoksa shrine. Byeongsan seowon is considered a model of architecture from the heydey of Confucian academies, built to be in harmony with the beautiful natural surroundings. Together with all the other seowons, I think they have potential to become WHS and it would make sense to remove the Byeongsan seowon from the core zone of the Hahoe WHS. I visited by taxi from Hahoe passing through a winding unpaved road to have more time than the 10 minutes offered if you visit by bus from Andong. However, road works are ongoing at the moment which will most probably pave the road by the end of this year. Site visited in November, 2016. There are in fact 3 daily buses to Byeongsan from Andong. First morning bus (7.50 from nearby Andong Train Station is the most convenient if you want to see the village, it is the same bus that connects Andong with Hahoe, 46) it goes to Hahoe, then to Byeongsan Seowon and returns to Hahoe and heads to Andong. Byeongsan Seowon itself looks recently restored- well maintained, covers relatively small area. All the buildings are described in Korean as well as in English (names and short explanation), easily visited, to see the building - half an hour should be enough, in fact the style of the buildings is similar to other Korean monuments. Don't miss the 400 years old restroom (having in mind the smell - it is still in use). Between two sites (Byeongsan and Hahoe) there is a convenient hiking path - 4 km - be prepared to at least one hour walk as it is mountainous although on a map it looks straight forward. The road is well marked, although only in Korean. The hike is obvious from Byeongsan - the only option apart from returning the road that bus goes, although it is not shown on Google Maps nor described in Lonely Planet guidebook. I visited Sosu Seowon (Yeongju) on a warm, sunny day in June. As the first Confucian Academy established in the Joseon Dynasty, it holds special significance. Before its construction in 1542, there is evidence this site was formerly a Buddhist temple. This explains the somewhat unconventional layout of this particular Seowon. A slight misfortune, when I visited Donam Seowon (Nonsan), it was pouring rain with only slight intervals. This fact, likely contributed to its emptiness and less pictures. I found Donam Seowon to be pleasant, but far smaller. Its authenticity could also (at least partially) be put into question based on Donam Seowon being moved from its original location. Yeongju and Andong are the best locations to reach several of the Seowon sites included in this nomination. Dosan Seowon and Sosu Seowon are the most known and celebrated. Because of a royal order of Heungseon Daewongun, father of King Gojong of the Joseon Dynasty, most Seowon were abolished and some were subsequently damaged or destroyed. However, despite the Anti-Confucian sentiment at the end of the Joseon Dynasty, the King's father spared 47 important Confucian Academies. All 9 of the Seowon included in this nomination are important academies that were spared, in part because they had produced many great scholars. Based on the ICOMOS evaluation, ICOMOS has questions about why these nine Seowon in particular, why not more/less? In addition, there were concerns about not including the surrounding environment, which is an important element of each Seowon. The comparative analysis was viewed as insufficient by ICOMOS, which wanted clarification about the differences between Confucian Academies in Korea, China, and Japan. I am sure this nomination will be re-submitted in a couple years, I'd be surprised if it was not inscribed. This summer, South Korea’s nomination of nine of its historic “seowons” will be under scrutiny from the WHC. Seowons were private institutions combining education (in the form of preparation for admission to the national civic service) and Neo-Confucian worship. A serial proposal such as this is always worth checking out in detail, as there may be hidden surprises among the selected locations. Personally I was happy to discover Dosan Seowon among the entries listed, a site that I visited on my Korea trip of 2001. Dosan Seowon is located not far from Hahoe WHS, and I visited both on the same day (I even included a third 'national treasure', Jebiwon Buddha). My trip notes about Dosan Seowon are brief: “Idyllic location. Very quiet, only a handful of visitors. Lots of Korean film directors apparently come here for shooting traditional Korean footage.”. All memory of my activities of that day have since blurred, and the fact that I had not labelled the photos in my Korea photoalbum does not help either (mind you, 2001 was the pre-digital age). There’s a large difference between the way I am visiting (future) WHS nowadays and how I travelled 15 years ago: I now put considerably more effort into arriving prepared. This research has only become possible because there is so much more information readily available. Dosan Seowon for example has a very detailed official website, where you can virtually walk through the complex. Each structure is shown and described. Thanks to that I was able to add captions to the 3 photos shown with this post. Trying to relive my visit, I found a little lesson on Korean Neo-Confucianism was necessary. Apparently the “Neo” in Neo-Confucianism dates from the 12th century, when in China superstitious and mystical elements of Daoism and Buddhism that had entered the original Confucianism were rejected. Korean scholars visiting China at the time were influenced by this new school of thinking, and brought it back to Korea. During the Joseon Dynasty, that started from the late 14th century, Neo-Confucianism became the Korean state ideology and Buddhism was restricted. Neo-Confucianism had a strong focus on education, and this aspect still remains a vital part of South Korean culture. Dosan Seowon in Andong was established by Yi Hwang, one of the most prominent scholars of the Joseon Dynasty. After passing his civil service exams, he worked for the government but left office after becoming disillusioned by the power struggles. In 1560 he built an academy called Dosan Seodang, where he - the author of many books on Confucianism in the Korean language - taught his students. The complex was enlarged and turned into Dosan Seowon by his disciples after his death. Yi Hwang’s spirit tablets are preserved here too. So will the Korean Seowons be an asset to the WH List? The Joseon Dynasty is already well-represented among Korea’s WHS, with the Jongmyo Shrine, Joseon Tombs, Namhansanseong, Hwaseong Fortress and Hahoe&Yangdong all dating back to the same period. And so are Korean Neo-Confucian sites, with again Jongmyo Shrine and Hahoe&Yangdong. The latter WHS even already contains two out of the nine proposed seowons! I believe these ‘Exact locations inscribed twice’ should not be encouraged. The Koreans could have gone for one outstanding Seowon (for which Dosan Seowon might qualify), instead of a series of locations that are mostly covering intangible heritage anyway.